Looking for a simple yet delicious Christmas dessert that can feed a crowd? 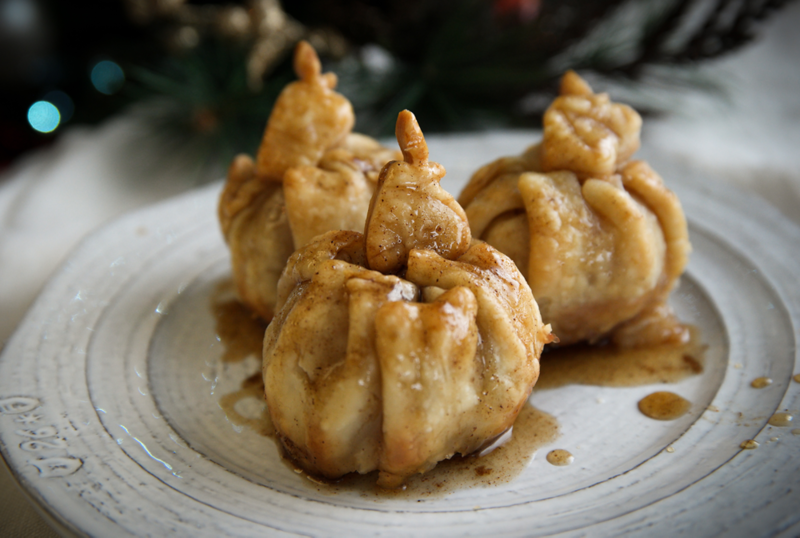 Look no further than our mini apple dumplings made with tiny Rockit® apples! This recipe is easy to scale up and is sure to please everyone at the table. Our tip: use ready-made pie dough to cut the prep time in half! First, make the sauce. Combine all sauce ingredients in a small sauce pan, bring to a boil and reduce to a simmer. Simmer until the sugar is melted and the sauce thickens slightly, about 20 minutes. 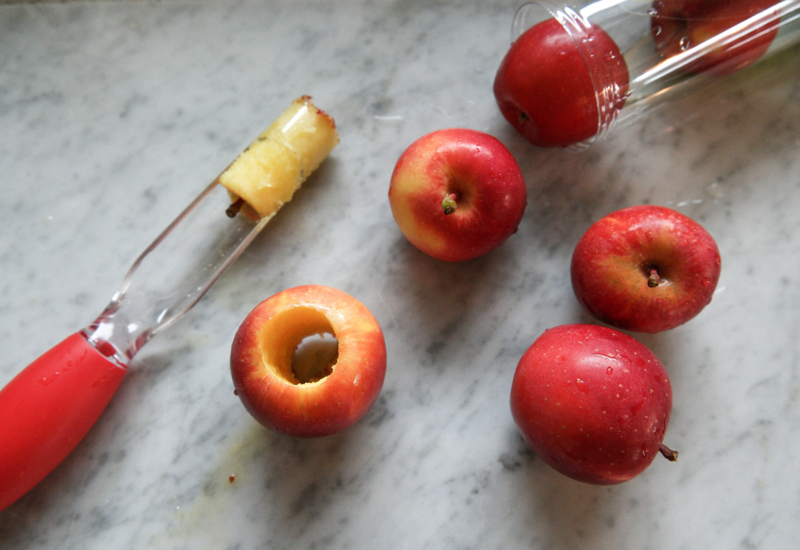 Core apples with an apple corer or a small knife. 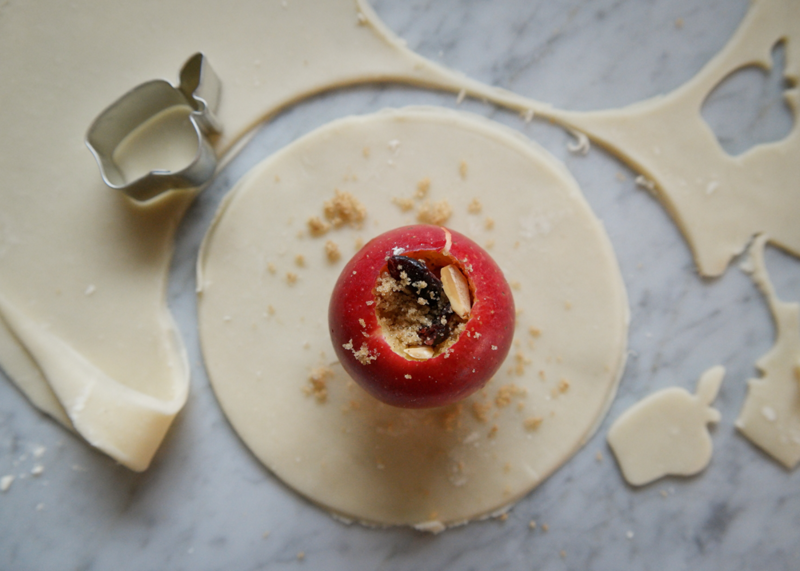 Peel apple, if you prefer your baked apples without skins (optional). In a small bowl, mix the brown sugar, nuts, dried fruit and cinnamon. Roll out the dough and cut 5 circles, each about 5 1/2 – 6 inch in diameter (you’ll need to make larger circles if not using Rockit® apples). You can use a bowl to mark the circle and a sharp knife to cut it out. Place one apple in the center of each dough circle. Fill the centers of each apple with the cinnamon sugar mixture. Pull up the sides of the dough circle to “wrap” the apple, pinching at the top to keep the dough from falling back down. Repeat with each dough circle. Place the apples in a small baking dish (ex. glass pie dish), leaving about a 1/2 inch between each. Don’t leave too much space between the apples or the sauce will burn between them. Set aside 1/4 cup of the sauce for serving, and pour the remaining sauce over the dumplings. Bake until nicely browned and sauce is bubbling, about 30 minutes. This may take longer if you are making a larger batch. Remove from oven and let cool for 10 minutes. Baste dumplings with remaining sauce before serving. Scoop out apples with a serving spoon and serve with extra sauce and vanilla ice cream if desired. Use the scraps of dough to make extra shapes for garnish, brush with the sauce after baking. Make it for a crowd! Just double or triple the recipe.